Janette creates a summer landscape with some circle nesting dies and the brand new range from CraftiPotential! Nesting dies are great for matting and layering your cards. They’re so versatile and are perfect for creating apertures and frames, but you can also create a quick scene with them. 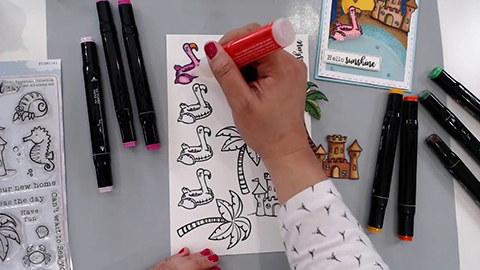 In this video Janette shares how to make a beach scene as well as how to colour these fun Seaside Cheer stamped images with Little Tipsy alcohol markers. Also, this is a great project if you have lots of paper scraps, since you don’t need a complete piece of card to create your landscape. Join Janette as she creates this summery card from start to finish!